(often shortened to H&S) is a bearish stock chart technical analysis reversal pattern that is found at market tops. A triple top is a variation of this. A reverse, or inverted Head and shoulders pattern is a Bullish equivalent, found at market bottoms. A Head and Shoulders is one of the most reliable stock chart patterns found in technical analysis charts, but it is important that volume confirms its validity. There are some occasions when the pattern can be found as part of a continuation phase, but in these cases it has usually not been confirmed by volume. The left hand shoulder is created by a consolidation following a move produced with good volume levels. Volume should decrease on the consolidation before buyers push the market to new highs but with lower volume than the LH shoulder. This creates the head as prices decline back to near the previous consolidation level low. The right hand shoulder is then formed on low volume when buyers re-enter but fail to gain momentum producing a lower high and the markets then decline again on higher volume. The neckline should be broken on high volume to confirm the move. High Probability Trading Alerts Service from the Worlds Leading Market Forecasting Service. From ETFs and individual stocks to futures, you get Flash Opportunity Alerts via email and phone to help you take advantage of the highest-confidence opportunities in the most popular markets. Find out more about EWI's High Probability Trading Alerts Service! In a normal market, price will usually come back up to backtest the validity of the break down through support. This move should be on much lower volume but on rare occasions, it may not do a backtest if the market is very weak. 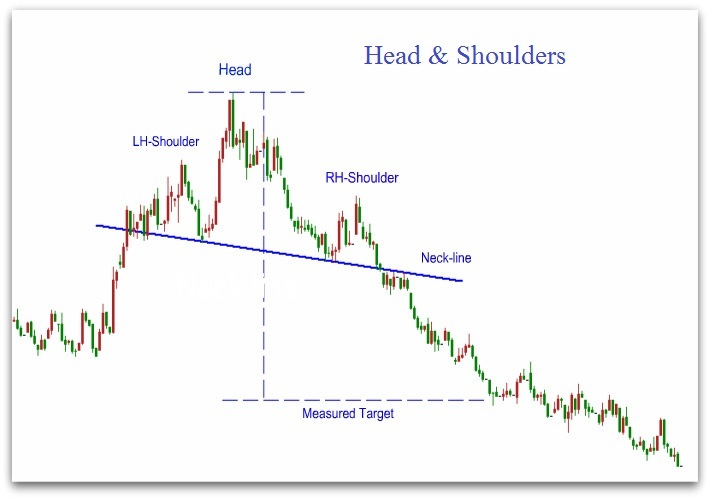 A valid Head and Shoulders produces a measured move so we can find a price target by calculating the vertical height of the Head, and then measuring an equal distance below the neckline. An H&S fails and is not valid if prices break back above level of the RH Shoulder before hitting its price target. Stop Losses can be placed just above the high. A reverse, or Inverted Head and Shoulders Pattern (often shortened to IH&S) is a variation of the head and shoulders and is a bullish stock market technical analysis charts reversal pattern that is found at market bottoms.